Carriers: Invite your next driver with just one click. Do you need to hire truck drivers? Well search no more! Qualified truck drivers are out there, and we help you find them. This video highlights Steve. He owns a trucking company. Check out how he finds, recruits and hires truck drivers. He uses Safety as a Service and Gary’s Job Board. These two premier sites are partnering to help you hire CDL Drivers for your open jobs. You can hire CDL Drivers, manage Driver Qualification Files and provide driver training: all in one spot. How We Can Help You Hire CDL Drivers? Safety as a Service is like Gary's Job Board on Red Bull. We Call It Active CDL Driver Recruiting. Here’s How It Works. Create a CDL Job Profile Here. You will gain access to Safety as a Service. From the Recruiting Tab we will show every truck driver that matches your requirements. You invite drivers to apply from there. You'll receive applications from drivers in the same place. No more sitting on the fence waiting for drivers. 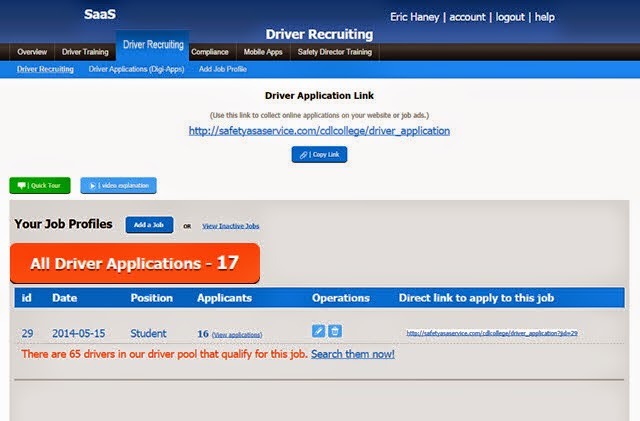 You can actively search and invite CDL drivers to apply for your job. Placing an ad on craigslist for a CDL driver puts you in waiting mode. Are you ready to start hiring the drivers you really want? Founded in 2010, Safety as a Service was developed as a training tool for trucking companies. Utilizing innovative online training and tracking systems, members train their drivers as often as they'd like. We added Recruiting to the platform in 2014 to help our Safety as a Service customers do more than just train their drivers. We found that our trucking company customers needed helping recruiting drivers. Now you have the power to improve your safety program with our online training portal, but you'll also find the truck drivers that fit into your program. A win, win for you and your drivers. 1. Create your Job Profile. Click SAVE. You'll receive an email to activate your account. 2. The Job Profile will save at Safety as a Service. 3. The Job Profile will trigger our designer to create the perfect help wanted ad. Don't worry your job will be posted in a couple of hours. We have an actual human being design and edit your ad before posting. 4. You'll have applications that have come in (we will also notify you via email), and update any details on your job profile. 5. Find and hire the right truck driver for your available job.